We have ALL been there. Yes, you. I’m talking to you. I’m also talking to your sister, your mom, your best friend, your spouse and I am also talking to myself. We have all come up with these small justifications about why “starting fresh” and “getting back on track” will start after another life landmark. What is a Life Landmark? Great question…I may have made it up so here’s what it means to me. It’s anything on your calendar that takes up your time and brings you a little bit out of your normal routine. It can be as small as having the whole family over for dinner and drinks (which I do often) or something as big as a wedding (also coming up soon for me). It can also be a slumber party for your child and their friends, date night with the hubby, a big football game you’re looking forward to, happy hour or a work trip. It doesn’t always have to be something fun and social like a hurricane (weird, also just something I went through, thanks Irma) a fender bender or even getting a renovation done in your house. Before we continue and before I share with you how you can once and for all STOP making up excuses that are holding you back, let’s dive deeper here. After helping people navigate their way through fitness and health, I have come up with my own theory as to why we do this and why it can hold us back so significantly. Bear with me…(and let me know if you can relate to any of these, comment below this article). Life landmarks are always present. Meaning what exactly? Meaning you will always have these things on your calendar. Unless you live under a rock, you will always have things going on in your life that may make it easy to escape into the realm of “I’ll get back to it after this event.” It’s a safe place to mentally be if you haven’t become comfortable with the idea of committing to a truly healthy lifestyle long term. Knowing that you only have to “eat well” for 3 days before another life landmark makes it seem less scary and painful! I KNOW, trust me, I’ve been there. I still battle. We have yet to really internalize that a healthy lifestyle isn’t measured in short periods of time, events, meals and in fact, isn’t quantitative at all. Eating well for 4-5 days and then eating poorly all weekend and not exercising isn’t a healthy lifestyle if it means that you mentally view health as something that occurs in short spurts! We have yet to crave the feeling of exercise as well as feeling nourished. This may sound nuts to those of you who really struggle with eating well or who deplore exercise. But our bodies are actually intended to move and sweat every day. They were designed to be active. Our insides, obviously, thrive when we are eating nutritiously. So ask yourself, have you given your body enough time to flourish under the proper circumstances? Do you know what it’s like to feel amazing and then feel crappy because you fell off the bandwagon for too long? I haven’t always been this healthy. In fact, I used to be pretty unhealthy, especially when I was in college and on my own. I always felt so sh***y that I forgot what it was like to feel great. When I made slow changes to my lifestyle, I was amazed at how great I felt and how I had gone so long feeling so bad! I now crave the endorphins I get from exercise! I really hope you believe me when I say that. I am not perfect. I drink wine. I love gluten-free pizza (no, I LOVE IT, it’s a serious problem). I have days occasionally, usually 2 or 3 in a row, where I cannot even stomach the thought of heading to the gym. What matters isn’t whether you never miss a day at the gym for the rest of your existence. It also doesn’t matter if you enjoy a few glasses of wine during the week or happy hour with the girls. You’ve heard it a million times and with good reason. Being healthy is a It isn’t a diet, it’s not temporary, and as I mentioned above, it’s not about X number of healthy meals in a week. STOP thinking about health as something you reach eventually. Health is ongoing. There is no light at the end of the tunnel. Your tunnel SHOULD ALWAYS be well lit. Health shouldn’t start the Monday after your trip or end the day you have your house party. It’s an ongoing thing that is fluid and flexible and moves with you throughout your life. *Please know I am not referring to serious health conditions, of course those situations are different. STOP beating yourself up. Seriously, it’s so toxic and it’s not effective. Maybe you’ve really fallen off the wagon. Maybe you’ve gained far more weight than ever before. Maybe your gym membership expired 6 months ago and you never renewed. Maybe you don’t even know where to start. Wherever you are right now, stop, sit down, acknowledge where you are and give yourself some love and compassion. Cry. Be mad. Do whatever you need to do. When you’re done, no more negative feelings. No more beating yourself up. You will not move forward that way. Create a plan and move forward (keep reading, I’ll give you some tips for that as well). 1. Don’t be extreme. Do not vow to go from 0 days at the gym each week to 2 a day for 7 days straight. We all know how this story ends. Set a reasonable goal. ANY additional movement will help your body get used to moving, sweating, being tired etc. 2. Use what you have. If a gym membership isn’t in the budget or maybe you just feel intimidated going there, go for long walks. Walking is incredibly underrated. Bring your phone and listen to a book or podcast and walk for 30 minutes every single day. Add time as the weeks go by or start walking with weights. You will be SHOCKED at the difference you see in just a week or so. 3. Stop buying bad food. Just stop it. Seriously, enough is enough. You’re a grown up. I will be the first to say that I have very little self-control. If bad food is in my house, I WILL eat it. I do however, have a lot of self-discipline and have no problem leaving the bad food at the store. Do not put it in your cart and tell yourself you will only have 1 during the week. Why make it harder for yourself? Instead, buy snacks that are healthy and good for you and substitute it. 4. PLEASE please please be patient. It’s one of the hardest things to do when you’re trying to lose weight, feel better etc. Results come with consistency. You are a complex and beautiful being. If things happened overnight, what would that say about us as a species? Also, while it’s nice to lose weight/inches, don’t forget that focusing on that means you have lost sight of the bigger picture. Health is a lifestyle and isn’t measured in inches! Once you start to lose weight, you will sleep better, be more motivated to work out, eat well etc. It’s a big beautiful circle! I hope this helped. Please comment your questions below. Let me know your thoughts and share what has worked with you. We get better by lifting each other up and supporting one another. Here’s to a better you tomorrow, next week and next year. Let’s set the positive example for your kids, grandkids and your friends. What about you? 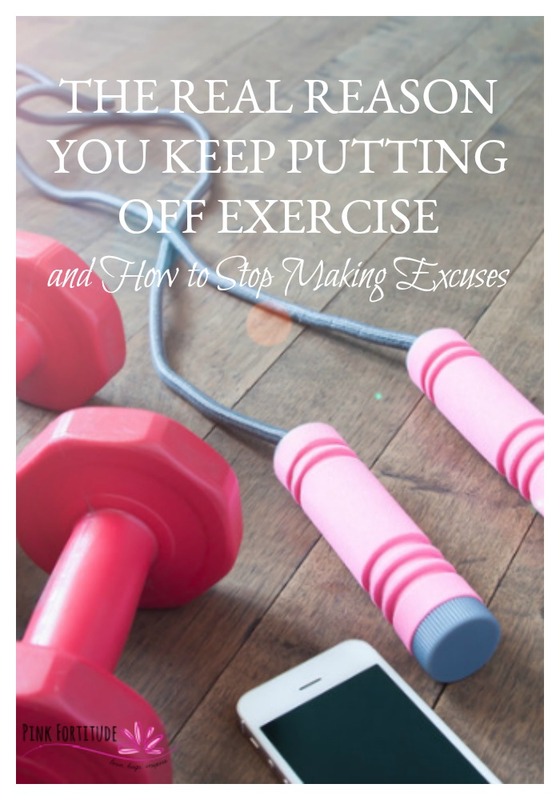 What are your top exercise excuses? How do you handle them?